Poe is a music drama based on “Alone,” a poem by Edgar Allen Poe. Using acoustic and electronic manipulations of their instruments, voices, and physical gestures, flutist Claire Chase and percussionist Svet Stoyanov explore facets of loneliness inside a living room built of visual illusions and spatially organized sounds. As the room contracts and expands, the performers face a paradox of human existence: that we are both never and always alone. 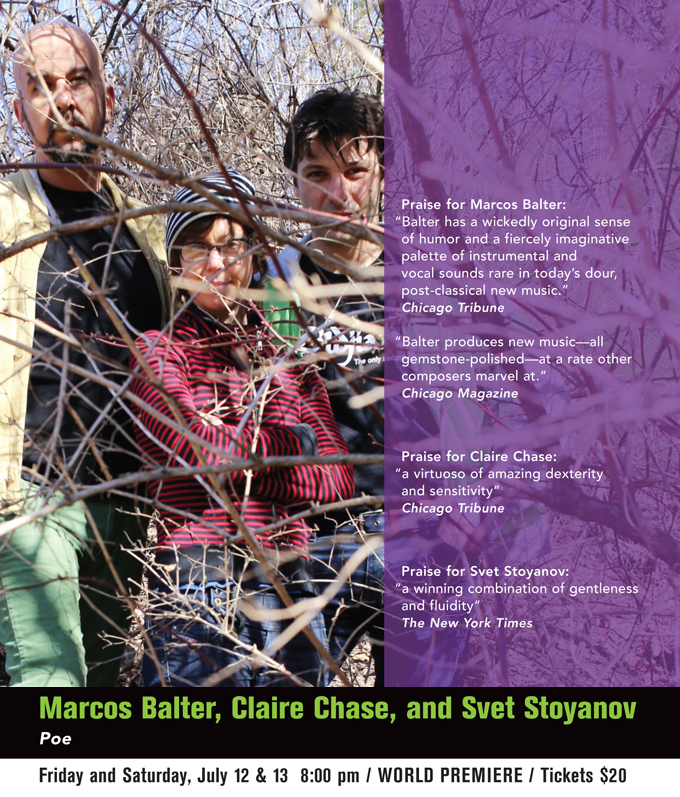 The music of composer Marcos Balter is at once emotionally visceral and intellectually complex. He is Director of the Music Composition program at Columbia College Chicago. Claire Chase, a 2012 MacArthur Fellow, is a soloist, collaborative artist, and arts entrepreneur. She is the founder and Artistic Director of the International Contemporary Ensemble (ICE). A passionate advocate of new music, Svet Stoyanov is a driving force in modern percussion. He is the Director and Professor of Percussion Studies at the Frost School of Music in University of Miami.